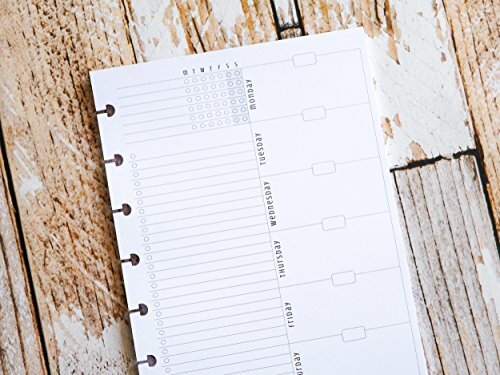 Weekly Planner Inserts | Mini Happy Planner Size | Undated by Jane's Agenda at Nicky's Blog. Hurry! Limited time offer. Offer valid only while supplies last. Plan your week starting on Monday. Keep track of your habits and possibly build healthy ones with our habit tracker. Make a task or grocery list. Plan your week starting on Monday. Keep track of your habits and possibly build healthy ones with our habit tracker. Make a task or grocery list. Keep appointments or meal plan on the front and take notes in the dot grid on the back. These are from our Awesome Planner Page Set, we sell the complete set in our shop. Includes 26 weekly pages (front is calendar, back is dot grid). This is undated, fill in the dates however you like. Please note that these are loose leaf planner inserts, they are meant as a refill for a planner you already own. You will not receive a planner with this order. View More In Appointment Books & Planners. If you have any questions about this product by Jane's Agenda, contact us by completing and submitting the form below. If you are looking for a specif part number, please include it with your message. Assignment Tracker for Disc-Bound Planners, Half Letter Size, Fits Circa Junior, Arc by Staples, 5.5"x8.5"